The Roland Jupiter-8 has always been one of my all time favorite synthesizers, and recently Roland introduced a boutique version of this iconic synth for all to enjoy. I’m not completely sure what is “boutique” about them, in that the word implies that they it’s only available in a limited supply, or a small run, but at $399 US it’s certainly within reach of most everyone. Considering the average selling price for a well maintained Jupiter-8 is approaching (and occasionally passing) $10,000 USD unless you’re a precious collector or a museum curator that just doesn’t make any sense to try to accomplish one of these beasts for your touring situation or humble studio. I remember dragging my $1,200 Jupiter-8 out on tour in the early 90’s and destroying it – absolutely heartbreaking. The JP-8 is heavy, and it’s huge, and it is a very sensitive device. She doesn’t like cold or hot, doesn’t like any humidity or moisture, and the air can’t be dry either. So it wants to be in a studio or a museum (even if it sounds best in a filthy warehouse.) Since then I’ve owned a Jupiter-6, JP-8000, JP-8080, MKS-80 (with and without the programmer) and purchased the Arturia Jupiter-8 V1 and V2. Always chasing that deliciously hollow and warm distant planet. Rarely holding it in my hands. 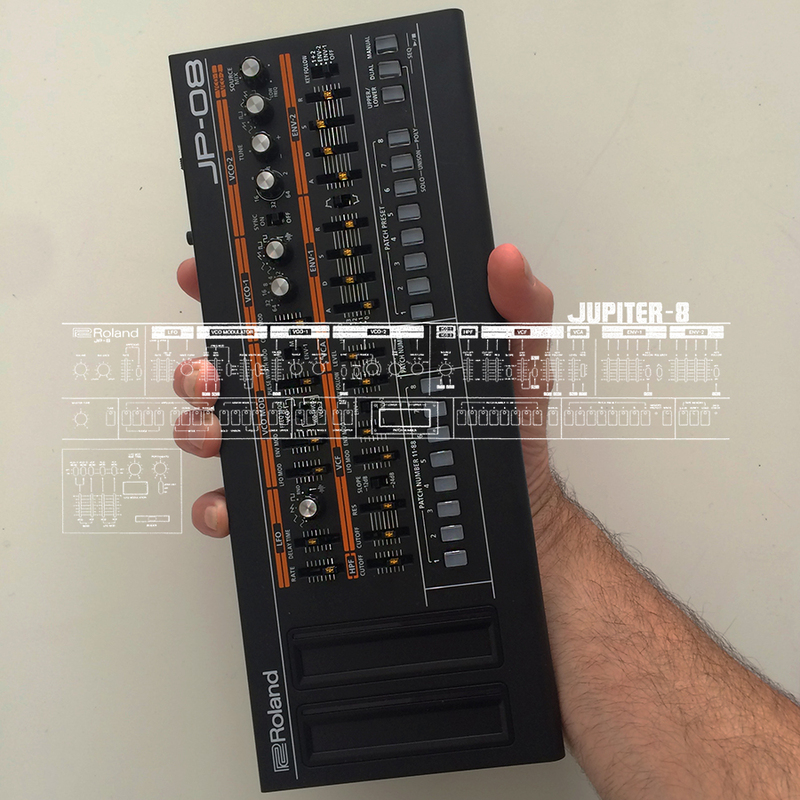 Last week Roland released the JP-08, the JU-06 and the JX-03. These little tiny book sized modules are digitally modeled reproductions of the Jupiter-8, the Juno-106 and the JX3P (respectively) and they sound great. they look great. They are very small. They are extremely affordable. • Audio input (at first I didn’t have two 1/8″ to 1/4″ cables and you can jack the JU into the JP and have them both play out the mains of the JP. Handy and compact. I like it. Searching for my favorite sounds I noticed some missing voices. So I pulled out my old Jupiter-8 manual and I started looking at the patches and how they were programmed. I started working on the choir and vocal sounds – because I am playing my amazing remix of Dagonette’s ‘Run, Run, Run’ in my live set and I need a choir for the backing pads. The preset isn’t included in the selections for the JP-08 and so I started moving the sliders and flipping the knobs until voila! there is was in front of me. Not exactly exactly right, but pretty good. 3. I hope this inspires Roland to keep going – I’d like to see a boutique TR-909, or a boutique CR-78, or SH-101 or anything else. Possibly even modular. Smaller and smaller, tighter, and more precise. I love it. If you’re with me here and want to do some of this experimentation on your own, please see below. I’ve included a blank Jupiter-8 patch sheet for you to print and mark up, so you can learn all you can about synthesis and remember your amazing patches. And I’ve also included the full patch sheets for the original factory settings for the Jupiter-8 so that you can compare and contrast to your heart’s content. Download the Blank Patch Note Template taken from the original Roland JP-8 manual. Download the patch sheets for the original Jupiter-8 factory presets and recreate them yourself. I hope this helps with whatever you’re working on. it’s like the world has listened to your post-911 cries, and sent you tiny toys from the future. Just happened to stop by your page, wondering if you had picked any up and guess what? You did! Loving the JP-08!!! Gonna grab the JU-06 next ;o) btw, I sent Roland an email regarding MIDI CC. Hopefully it will be implemented at some point. I sooo wanna sequence those bits.